In order for you to attract Martins there needs to be at least forty feet of open space. Martins like to have space where they can fly and catch insects such as mosquitoes and dragon flies. Martins like to live in areas that have open meadows, fields, and of course farmland. 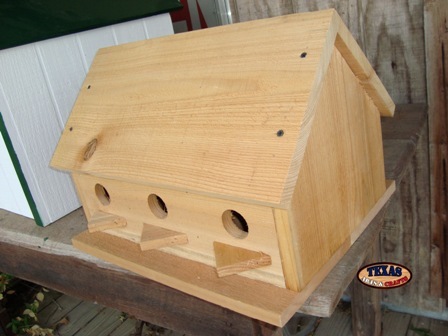 The bird house for the Martin bird should be placed at least ten feet up on a tree or a pole. We hand build the Purple Martin Bird Houses in our workshop out of cedar. The bird house has six rooms. Bluebonnets are hand painted on to the sides of the bird house, and the Texas state flag is painted onto the roof. The size, colors, and decor may vary slightly as it is hand made. 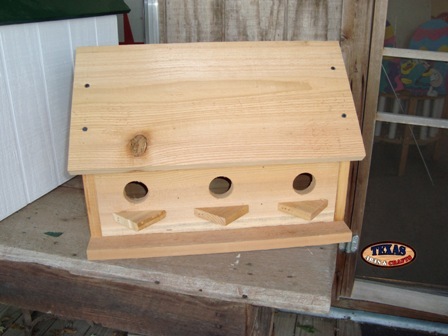 The bird house is 15.75 inches tall by 16 inches wide by 11.50 inches deep. The bird house weighs approximately 20 pounds with packaging. For the continental U.S. shipping and handling is included in the listed price. For shipping outside the continental U.S. please contact us through our Contact Us page. We hand build the Purple Martin Bird Houses in our workshop out of cedar. The bird house has six rooms. Three on the front and three on the back. The size may vary slightly as it is hand made. 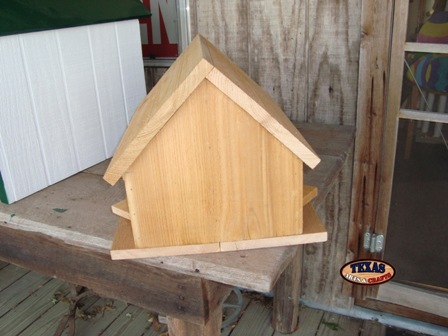 The bird house is 13.25 inches tall by 19.25 inches wide by 15 inches deep. The bird house weighs approximately 25 pounds with packaging. For the continental U.S. shipping and handling is included in the listed price. For shipping outside the continental U.S. please contact us through our Contact Us page.